I had a call, today not far from the shop, to stop a toilet leak. What I had gleaned from the initial call was that the toilet was a couple of years old, was installed in lieu of repairing the old toilet, and was leaking. I arrived at the job near to the agreed time of 4:30 hoping I would not have to drive to town for some proprietary parts. Having parked the truck I took a second to consider not taking the tools in. I decided not to and went to the door empty handed to find out what was wrong with the toilet and if I needed to bring in tools or head off to town for parts before everyone was closed. 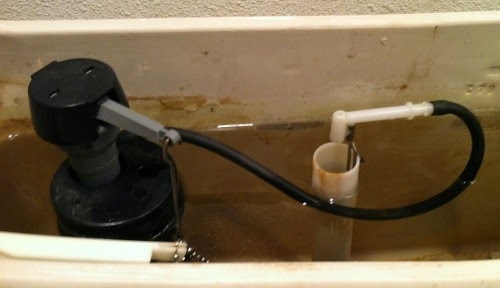 The home owner lead me upstairs to a one piece toilet, its lid was off and the water level in the tank was low. As I was looking at it the owner brought me a selection of various 3" toilet flappers so that I might be able to tell him which one was the correct flapper. Another new flapper was already installed. Meanwhile he explained that the toilet was cycling. 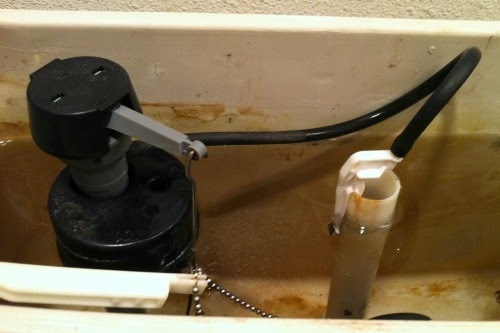 That is to say the fill valve could be heard refilling the tank when the toilet was not being used in any way. Cycling usually indicates a bad flapper that is allowing tank water to drop down into the bowl. This drains the tank to the point where the fill valve must open to top off the tank. That feeds the flapper caused leak and so on. He was tired of the noise and the wasted water so the angle stop was closed. I was barely paying attention, I already knew what the trouble was and it was nothing to do with the flapper. I turned the water back on to confirm what I was certain of. I really like the line of products made by Fluid Master. Their stuff is innovative and reliable. Their toilet fill valves are installed as original equipment by a few toilet manufacturers. Other manufacturers use off brand fill valves that mimic the engineering Fluid Master pioneered. All this is not to say that their fill valves don't have quirks but the main quirk only occurs when the instructions are not followed. 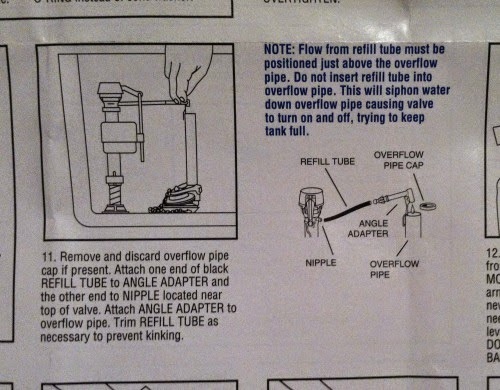 There it is, right in those pesky instructions. The fill valve I had in front of me today was an off brand "works like a Fluid Master". It worked enough like one to have the quirk regarding the primer tube siphon. The primer tube siphon works like this. The primer tube is long enough to fit various toilet tanks. It comes with a factory tip that fits to the overflow tube so that the fill valve is anti-siphon. The overflow already has a primer tube holder that kept the original primer tube set into the overflow tube. So, the new adapter is cast aside and the new primer tube is pushed into the old primer tube holder. Its full uncut length is pushed into the old primer tube holder. This runs the new tube down the overflow to some point well below the water level in the tank. 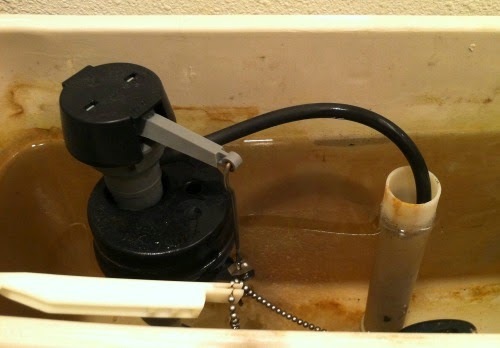 As soon as the toilet is flushed and the new primer tube is filled with water a steady siphon is set up as tank water is forced through the primer tube by the weight of the water in the tank. This arrangement is good for flapper sales but not for water conservation. As the home owner presented me with a couple of 3" flappers to choose from I interrupted him to show him the leak. I lit the flashlight on my I-Phone and let him see the steady trickle of water streaming out of the primer tube which was a good 3 inches down the overflow. Then I drew the tube up and out of the old primer tube holder and let him hear the low gurgle of the siphon breaking. I then removed the old primer tube holder from the overflow tube. A quick trip to the truck for one of my salvaged Fluid Master primer tube adapters and I announced that the leak was stopped and the toilet had been repaired. He was confused so I ran through it again. I explained how the nuisance leak worked, how it was stopped, and let him hear the siphon breaking at the end of each fill cycle. I had seen what was wrong and made the repair before he was done explaining the symptoms. I had done it with no tools and a salvaged Fluid Master primer tube adapter. This is the new style primer tube adapter. Used by Fluid Master. This is the old style primer tube adapter. Used by Fluid Master. These photos are not from the job detailed above.